In late 1994, back in the days of dial-up modems and Netscape Navigator 1.0, Mute magazine announced its timely arrival. Dedicated to an analysis of culture and politics ‘after the net’, Mute has consistently challenged the grandiose claims of the communications revolution, debunking its utopian rhetoric and offering more critical perspectives. 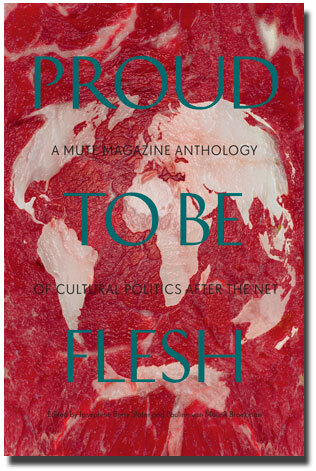 Fifteen years on, Mute Publishing and Autonomedia are delighted to announce the publication of Proud to be Flesh: A Mute Magazine Anthology of Cultural Politics after the Net. The anthology selects representative articles from the magazine’s hugely diverse content to reprise some of its recurring themes. This expansive collection charts the perilous journey from Web 1.0 to 2.0, contesting the democratisation this transition implied and laying bare our incorporeal expectations; it exposes the ways in which the logic of technology intersects with that of art and music and, in turn and inevitably, with the logic of business; it heralds the rise of neoliberalism and condemns the human cost; it amplifies the murmurs of dissent and revels in the first signs of collapse. The result situates key – but often little understood – concepts associated with the digital (e.g. the knowledge commons, immaterial labour and open source) in their proper context, producing an impressive overview of contemporary, networked culture in its broadest sense. Proud to be Flesh features a bold mix of essays, interviews, satirical fiction, email polemics and reportage from an array of international contributors working in art, philosophy, technology, politics, cultural theory, radical geography and more. Accessible introductions, a chronological arrangement of chapters and three full-colour image sections grant special insight into the evolution of key themes over time. In its refusal of specialisation, Proud to be Flesh is unique in its field. It offers a compelling view onto the messy but exciting moment that was the turn of the millennium as well as being an incomparable source book for those seeking to push forward analysis of the global crisis that has since ensued.